(TORONTO, ONT.) 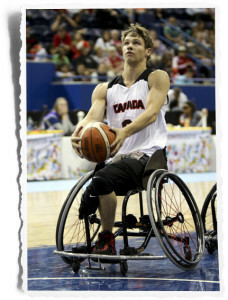 The ability to fight through adversity was key for the unbeaten Canadian Parapan Am Men’s Wheelchair Basketball Team Wednesday when they routed Puerto Rico 73-34 in order to earn their spot in Friday’s semifinals. Carrying a 4-0 record Canada will now face 3-1 Brazil for their chance to advance to the gold medal final. With two berths available, a win on Friday would guarantee the Canadian Men a spot in the Rio 2016 Paralympics. “Step by step, inch by inch, and game by game, we are building toward our goal of securing our spot in Rio. We are a young team that is rebuilding, and we know what we have to do to be successful. We are focused on the outcome and despite the challenges we are confident in our ability to get there,” said Team Canada’s head coach Steve Bialowas. Despite outscoring their opponents by a hefty 39 points, the Canadians struggled to find their rhythm at times. They shot just 36% from the field in the first half, but still managed to establish a 12-point lead heading into the break. Puerto Rico’s Carlos Ocasio stole some of the momentum by beating the buzzer with a long distance three-pointer making the score 34-22 at the end of two frames. Thanks in part to some sharp shooting by youngster Liam Hickey, of St. John’s, N.L. who was four-for-four through three quarters, and eight-for-11 on the night from two point territory, Canada went on a 19 point run and drastically improved their accuracy to 56% by the end of the game. “[Going into next game] we just have to mentally prepare. We know what we have to do. We’re well trained, we’ll go in, we’ll finish strong and I know we can do it,” said Hickey. “We always say ‘don’t think about the next game, always think about the game at hand,’ but I think we did that a bit too much and that is why we came out slower than usual,”said Nik Goncin of Regina, Sask. With 16 points, Hickey was second in Canadian scoring only to Montreal, Que. native David Eng who led Canada with 20 points and nine rebounds. Teammates Goncin and Adam Lancia, of Toronto, Ont., also reached double-digits on the scoresheet with 14 points and 11 points respectively. Meanwhile, Vincent Dallaire, of Quebec, Que. led all players with four assists. Throughout the match Canada thrived on their ability to cause turnovers and limit Puerto Rico’s opportunities to generate assists. Through 40 minutes Puerto Rico accumulated a meagre four assists while gifting Canada the ball 29 times. Abdi Dini, of Toronto, Ont. was instrumental in this area. Moreover, he demonstrated his knack for getting in his opponents way by drawing five fouls.